Evolution under severely stressful conditions has endowed the Middle Eastern subterranean blind mole rat (Spalax ehrenbergi) with unusual longevity, hypoxia tolerance, and cancer resistance, with spontaneous tumor formation never observed. These extraordinary characteristics led researchers from the laboratory of Irena Manov (University of Haifa, Israel) to investigate the potential mechanisms at play, with their previous report establishing that normal Spalax-derived fibroblasts displayed the remarkable ability to inhibit cancer cell growth via either direct cell-to-cell contact or paracrine-acting factor expression . Now, in a new STEM CELLS study, Mamchur et al. assess the contribution of Spalax adipose stem cells (ASCs) to tumorigenesis, given the knowledge that cancer cells can recruit ASCs from adjacent tissue to form the tumor-promoting microenvironment . Excitingly, the authors discovered that a notable lack of ASC migration towards tumor cells and associated poor intratumoral angiogenesis contributed to cancer resistance in Spalax . 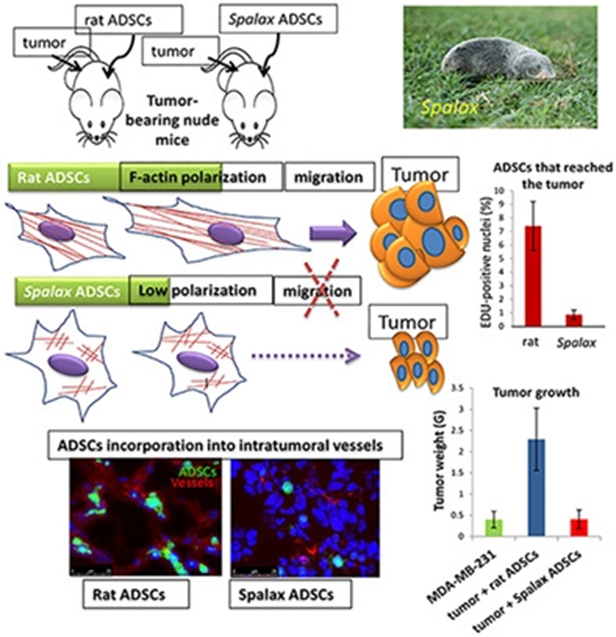 First comparisons indicated that rat ASCs possessed a highly motile profile and exhibited extensive migration towards cancer cells in vitro and migration towards and subsequent penetration of tumors in an in vivo model, where they developed an endothelial‐like phenotype and displayed potent intratumoral vasculogenic capacity. However, Spalax ASCs displayed low random motility, rarely migrated towards tumor cells, and displayed low endothelial/vasculogenic potential, and there fail to provide sufficient support for tumor growth. Of note, while rat ASCs migrated towards fibrosarcoma cells derived from Spalax, Spalax ASCs displayed no such migrational capacity, suggesting that species-specific differences did not affect the migrational analysis. But what causes this lack of migration and motility in Spalax ASCs? Further analysis established that hyperphosphorylation of the myosin light chain (MLC) disrupted cell polarization, an important feature of motile cells, thereby diminishing the migration and motility of Spalax ASCs; however, inhibition of MLC phosphorylation provided Spalax ASCs with rat ASC like motility/migrational capabilities. The authors propose that Spalax evolved sustained MLC phosphorylation and an associated high level of muscle contractility as an adaptive mechanism to aid the burrowing activities under highly stressful situations  and that the extension of this evolutionary trick to non-muscle cells may affect contractility and hence motility. The authors hope that their extraordinary findings may facilitate the development of new anti-tumorigenic strategies; to hear all about future blind mole rat studies, stay tuned to the Stem Cells Portal! Can we specifically target ASCs to inhibit the development of tumors in human patients? What other mechanisms do blind mole rats employ to gain resistance to cancer? Do other mammals exhibit similar cancer‐prevention strategies and can we take advantage of them? Manov I, Hirsh M, Iancu TC, et al., Pronounced cancer resistance in a subterranean rodent, the blind mole-rat, Spalax: in vivo and in vitro evidence. BMC Biol 2013;11:91. Quail DF and Joyce JA, Microenvironmental regulation of tumor progression and metastasis. Nat Med 2013;19:1423-37. Mamchur A, Leman E, Salah S, et al., Adipose-Derived Stem Cells of Blind Mole Rat Spalax Exhibit Reduced Homing Ability: Molecular Mechanisms and Potential Role in Cancer Suppression. STEM CELLS 2018;36:1630-1642. Avivi A, Band M, Joel A, et al., Adaptive features of skeletal muscles of mole rats (Spalax ehrenbergi) to intensive activity under subterranean hypoxic conditions. Acta Histochem 2009;111:415-9.